Alleged serial cannibal Dmitry Baksheev used dating sites to recruit women who he and his wife then killed and ate, it is claimed. Wife Natalia Baksheeva has told police the gruesome family had at least 30 victims over 18 years, and it is feared she fed human meat to student pilots in the military academy where she was a nurse, according to reports in Russia. 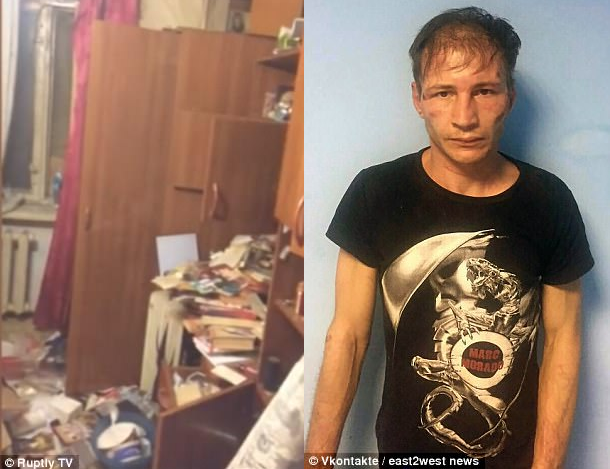 According to Daily Mail,State investigators are seeking to verify the claims about dozens of victims of the sinister pair from Krasnodar who were detained after seven bags of body parts were found in their fridge and freezer. At least one jar with pickled human remains, and 19 slices of skin were also discovered in the macabre flat. Many cans with steamed meat were found in their kitchen, a source told Komsomolskaya Pravda. 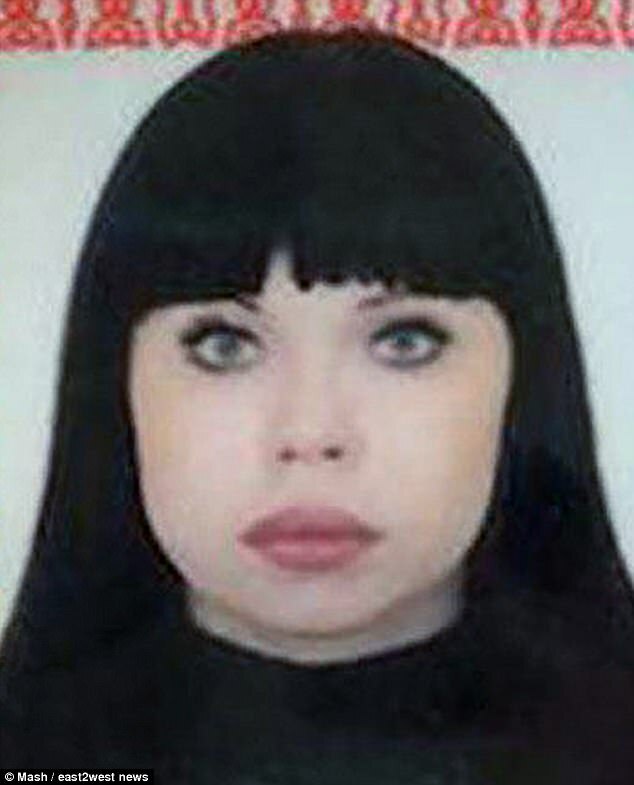 Today it was claimed that wife Natalia Baksheeva, 42, had taken her 35 year old orphan husband in as a teenager and wed him when he turned 18. Police fear that Baksheev found victims by setting up meetings on dating websites. His wife is reported to have been shown the faces of missing women in southern Russia and identified dozens who she claimed were their victims. ‘Going through the photographs, the woman has recognised more than 30 victims that they killed and eaten together with her husband. Separate reports say Natalia was checked by a psychiatric hospital and found to be ‘mentally healthy’. In their home, many mobile phones of their victims were found, and also video lessons on how to cook meals from human meat,’ said the police source. Baksheev was originally detained after a man found his mobile in the street in regional capital Krasnodar and saw images of him posing for selfies with a woman’s body parts. ‘He took a selfie with the hard in his mouth, at the same time he put the fingers of the dead hand into his nose,’ said a police report. ‘The earliest date of their culinary experiment is 28 December 1999 – the date on one of the photographs. 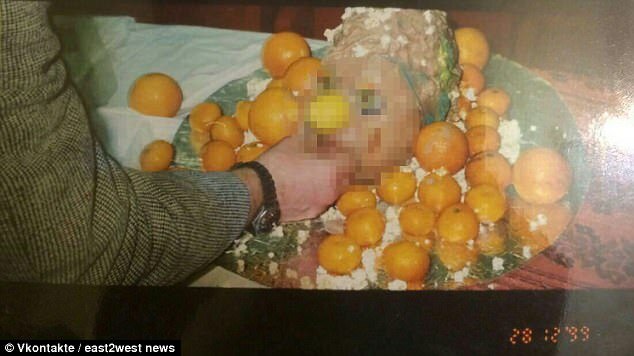 ‘We can see a cooked human head at the big plate surrounded by mandarins. ‘They put olives into the eyes and attacked a lemon to the nose. 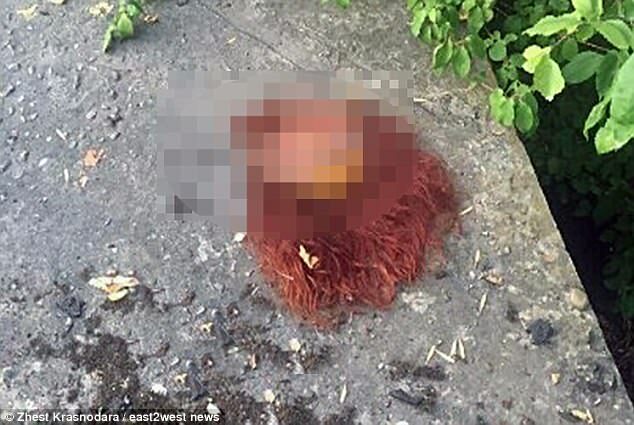 A police search found body parts in a rubbish container near the hostel where the pair lived, and a red-haired woman’s head in a metal bucket, with human skin nearby. More human remains were found in a cellar. The woman was identified as Elena B, who lived in the same military academy where the alleged cannibal couple resided. It is believed she was killed in a forest nearby and her dismembered remains were carried to his home by Baksheev in a backpack. Both suspects have been detained pending further investigations.